In 2008 on of the worst movies to come out of the found footage fad was Cloverfield. A movie that was being touted as the US answer to Godzilla, but in reality was a terrible shaky cam found footage ripoff of the a better movie. The movie didn't do as well as people would have hoped and the idea of a sequel never gained any traction. But somehow eight years latter and with no hype or build up a sequel dropped from the sky. 10 Cloverfield Lane is a sequel in name only, it has nothing to do with the first one and that is probably why it's so good. 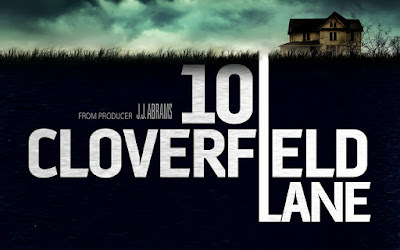 10 Cloverfield Lane follows Michelle (Mary Elizabeth Winstead) who wakes up to find herself in an underground bunker with two men after a car accident. Howard (John Goodman) tells her that a massive chemical attack has rendered the air unbreathable, and their only hope of survival is to remain inside. Michelle is unwilling to believe that life above has changed so drastically and begins to plan an escape. John Goodman is one of the top five actors working today and the reason for this is because he has genuine talent. Be it a giant blue closet monster, a singer turned king or just a badass psycho Goodman delivers with each role a well crafted and believable performance. Goodman delivers a performance that is on par with Anthony Perkins in Psycho. His ability to be threatening in a non-threatening way makes for a story where you're not sure if he is lying or a weird kidnapper. This is Goodman's movie all the way through and everyone else is just here to watch. Mary Elizabeth Winstead is a very good actor and really excels in the horror genre. She never gives a flat performance and commits to every role she undertakes. In the role of Michelle she brings the balance that every horror film needs and that is the character who refuses to go with the flow. Winstead is awesome in the role but her character feels a bit under written and as good as she is you can't help but feel that something is missing. 10 Cloverfield Lane is a taut horror thriller that channels the heart of Psycho and Silence of the Lambs, then gives it a dusting of Aliens just for good measure. To not see this would be doing yourself a huge disservice, especially if you are an avid genre fan.